Dog fighting is a barbaric “game” in which two dogs are pitted against each other in order to create a vicious spectator “sport.” Heartless people attend these fights to be entertained and to bet on the outcome. The dogs are intentionally bred and trained to fight. Dog fighting is a form of animal cruelty and is considered a felony in all 50 states as well as under federal law. The common type of dogs that are used is collectively known as pit bulls. Dogs require love and companionship so dogs who are trained to be fighters are neglected of this attention to trigger their survival instincts. They are bound by short, heavy chains and are exercised under harsh conditions. They are forced to tread water, run on treadmills, and hang from chains with their jaws. Beyond this, they are frequently injected with steroids to increase muscle mass or even narcotic drugs to enhance their aggression. Some breeders go as far as sharpening the dog’s teeth, cutting off the dog’s ears, or feeding the dog roach poison so their fur tastes badly. Dog fighting is an extremely underground event. Information about its whereabouts are usually spread through word of mouth. It is commonly done in places where escape can be quick – warehouses, garages, and abandoned homes. A pit is either a dirt or carpeted floor with a wooden fence. Two dogs are placed into the pit and fight until one is severely injured or dies. Physical injuries during the fight can include serious bruisings, deep puncture wounds, and broken bones. After the fight, the dogs frequently die from shock, dehydration, blood loss, exhaustion, or infection from their injuries. Sometimes, if the dogs do not fight well, the breeders will abandon, torture, or murder them. Bait dogs are the dogs that are used to practice on. They can be any breed and, in fact, they can even be cats and rabbits. Breeders obtain bait dogs by stealing them from families, responding to “free dog” advertisements, and finding low price dogs at shelters and pounds. Dogs who were intended to be a fighter but are not very good at it are also used as bait dogs. Bait dogs are muzzled and forced to confront an aggressive fighter dog. In the process, they are frequently mauled apart and left for dead. What’s even scarier is the fact that statistics on bait dogs are unavailable so we don’t know how many bait dogs are stolen, come from shelters or are acquired from free ads. We don’t know how many strays are captured to face their horrible fate. We don’t know how many of our once loved pets die this horrible death. Unfortunately, because dog fighting is highly secretive, it can be very difficult to spot. Signs of dog fighting can include an unusually high number of pit bulls in one location, dogs with scars on their faces and legs, dog fighting equipment hanging from trees, and people frequently coming and going at odd hours. If you believe that it’s happening, contact local law enforcement. 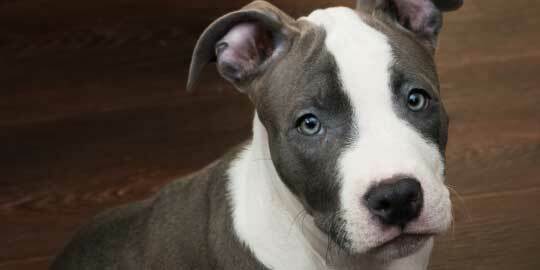 The Humane Society of the United States has a list of 15 things you could do to stop dog fighting in your neighborhood. Writing this article was a struggle due to its brutal nature. I wasn’t aware of how dangerous it is. After researching this inhumane “game” and recognizing that it, not only gives pitbulls a bad rep, but also causes so much pain and suffering in loving creatures, I feel a sense of educated responsibility in spreading awareness about this horrific activity. Dog fighting is one form of animal cruelty and, as April is the Prevention of Cruelty to Animals Month, it is our responsibility as dog lovers to help our furry friends lead a long, loving, CRUELTY FREE life. Say NO to Animal Cruelty. Spread the word so others too can help protect defenseless animals. Let’s Celebrate, NOT Segregate, Black Canines!